At this year’s Apple Event, Apple announced a brand new arcade subscription service called “Apple Arcade”. Apple is calling it the “world’s first gaming subscription service for mobile, desktop, and living room”. With this, they also revealed a number of different companies who are partnering up with Apple for the service. One of whom is our beloved SEGA. SEGA contract studios, Sumo Digital and Platinum Games, are also joining the service along side other top named studios. You can see the rest in the tweet below. And it’s not stopping there. 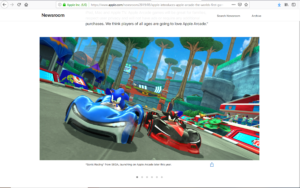 A press release from Apple also hints that Team Sonic Racing is going to be ported to iOS devices, which is slated to release later this year. Apple Arcade is coming this fall, no word on how much the subscription will be. You can visit the official website here.